The Russian Armed Forces will take delivery of a new 9-mm handgun to replace the aging Makarov pistol in the next few months, Deputy Prime Minister Dmitry Rogozin said on Wednesday. “We are certifying a new pistol, the Strizh, which will replace the Makarov pistol in the next few months,” said Rogozin, who oversees the defense industry, in an interview with Rossiya 24 television. The Makarov pistol has been the standard issue weapon or the Russian military and police for over 60 years. Strizh has been developed by a Russian private company, Arsenal Firearms, with the advice of special forces instructors. The new handgun has better performance than the Austrian-made Glock 17, a favorite of special forces worldwide, Rogozin said. The weapon has a slim-profile polymer frame, an easy-to-rack slide with rear and front serrations, an ambidextrous magazine release and a Picatinny rail for mounting special sights. The pistol also has three safety mechanisms to prevent accidental firing. Strizh holds 18-round or 30-round ammunition clips, and can be equipped with a flashlight and a laser sight. It can also be fitted with a longer barrel and used as a machine-pistol. Previously hasn't the Grach, Gurza, and GSh-18 all been described as Makarov replacements? Should be interesting to see who adopts what. Most civilians that have little to do with firearms believe pistols are very useful weapons as portrayed on TV they seem to be very effective on shot killers. Many soldiers I have chatted to like pistols for their rarity rather than effectiveness. In most cases a SMG is much better than a pistol and an assault rifle is much better than a SMG, but sometimes there is no room to carry a weapon... so you carry a pistol. My own views of pistols are also shaped by their relative rarity here... you can't go hunting with pistols here at all, and wanting one for self defence is not considered a legitimate reason for owning a pistol here. The last we heard about this pistol it was just a prototype, so I wonder if it has gone through any tests yet. Strange that this weapon seems to be ready to replace the Makarov while the AK-12 is still being tested. Hopefully when it starts making it into the military in numbers, some of the guys still serving that I know, might be able to tell me more about it. The best thing abour the Makarov was its simplicity... the slide, the main spring and the body of the pistol plus of course the magazine. The photos I have seen of PYa stripped seem to show lots of little parts that can be lost. I of course appreciate that the 9 x 18mm rounds have low wounding potential, but for a military man it makes the same 9mm hole a 9mm western round makes and it makes it in a simpler weapon. Most western gun experts derided the Stechkin as being backwards because it was a machine pistol, but from what I have seen most military men like it and it is still relatively widely used even today... the 20 round capacity is still good, and if you find the full auto feature is useless... well you don't have to put it in full auto... you can just use it as a pistol that is no heavier than a 45 cal pistol loaded with 7 rounds. SMG are more useful than pistols because a burst of 9mm rounds is more effective than single hits and pistols tend to be used inside the same room sort of distances... where a burst of rounds would be much more effective than several independent shots IMHO. The PMM was definitely an improvement over the Makarov with 12 shots instead of 8, but for most soldiers a pistol is a token weapon. Having said all that for some soldiers there is no chance of carrying anything bigger, or it is a backup weapon which needs to work first time and every time. Personally I think if they want more power then the Gurza with its 9 x 21mm rounds offer significantly more fire power. The adoption of NATO 9mm is interesting because the Russian ammo is far more powerful than NATO standard ammo so Russian forces will be able to use captured or borrowed NATO ammo with the risk of reduced reliability in some weapons, while the NATO "friends" will not be able to use the much hotter Russian ammo without damaging their weapons with the more powerful rounds. It is interesting that the article above suggests that a long barrel can be fitted when needed and it can operate as a machine pistol. The thing is that I would expect if you could carry the long barrel version you would actually be much better off carrying a Klin or Kedr or Kashtan SMG. Still I think a machine pistol model would be quite popular... I would just like to see how many parts this weapon strips down into and of those parts how small they are. GarryB wrote: The best thing abour the Makarov was its simplicity... the slide, the main spring and the body of the pistol plus of course the magazine. There are many situations GazB, in which a pistol will simply be the first thing that's available; way before anyone can get to the armoury and assemble & arm the soldiers. Particularly in quiet military bases that are not expecting any action. But action can come at any time to any point in today's Russia, with the threats that it faces in the form of persistant terrorist threats. So no, I can't agree with the opinion that pistols are only a status symbol. Indeed in many less organized or prepared units, such as logistic bases, etc...; the people who have them will inadvertently end up as the first line of defense, before the bigger guns can come into play. The problem is that to actually be proficient with a pistol you need to shoot it a lot! I am talking hundreds to thousands of rounds a week. It is really only special forces in the military or police that have that sort of time to spend on getting good and staying good. Even a SMG is a better weapon as it is still small and compact but is easier to learn to use effectively. Don't get me wrong... some experts believe the best use for a pistol means it only needs one round loaded, for the most part a pistol is a difficult weapon to use effectively and requires a lot of training and is therefore relatively expensive in comparison to a SMG or PDW. I agree the Makarov should be replaced, and I think this new weapon will be a useful part of the solution to the problem of replacing it. I think the PYa and Gurza and GSh-18 are also part of the solution, though I would like them better if they reduced the number of parts to the bare minimum and eliminated the tiny bits completely to make them more soldier proof. New rails to allow adding lights and lasers would be a fairly straightforward thing too. Ideally you would want every soldier to carry a pistol as a back up weapon for situations where you need a hand free, or in case your primary weapon fails for whatever reason... or is out of reach. The problem as I mentioned above is that the training needed to make it worth the cost means it probably makes more sense to equip soldiers you would give pistols (like snipers or RPG operators or weapons crews0 would probably be much better off with a short barrelled AK-12 or AKS-74U... or indeed a Kashtan or Kedr or Vityaz. The problem is that AFAIK this new pistol has only recently been described as being in the prototype stage and is made by a new firearms firm... lets see if it can do the job before we jump to any conclusions. The main problem I have heard regarding the Gurza is the cost of the ammo... if the 9 x 21mm round was selected as the new Russian pistol and SMG cartridge then that problem will sort itself out. Alternatively the Gurza could be made in the new hot 9 x 19mm NATO calibre, which would also solve its problem, though its purpose is for use against enemy wearing protective vests for which the 9x21 is better than 9x19mm. Keep in mind that the 9mm has been criticised in western use as being inadequate from a pistol... the question is, will a new round solve the problem or do they need a machine pistol or even SMG and rely on multiple hits to make it more effective? The PYa, I have been told, has been described as being too heavy... so more exotic materials and a small redesign could fix that. The GSh-18 I have seen being fired underwater using the new 4.5 x 19mm cal underwater round for use by divers and navy personnel so I would expect it might be accepted too. This new pistol could be the standard special forces pistol, along with Gurza when the targets are known to be wearing vests. This would really mean it would be replacing the APS rather than the Makarov. The GSh-18 can be used by VDV and Naval Infantry along with the ADS rifles that they seem to have adopted. The PYa can be a standard general issue Police and infantry weapon... all the above with pic rails etc added so you can fit torches and laser designators etc etc and modified to reduce the number of separate parts would be the best result in my opinion. Of course it all comes down to price... if this new weapon is cheaper than the PYa then there is little reason for having the PYa, and if it can shoot safely underwater then the GSh-18 needs to do something it can't. I would think a full auto capable version as standard would be popular and a 9x21mm model might also bring into question the need for Gurza. Even the old Tokarev TT pistol and Nagant revolver are good enough for 98% of duties expected from a sidearm. Makarov and Stechkin pistols are slightly better. PYa and GSh-18 are marginally even better. Because they didn't have a safety. Of course a revolver doesn't have a safety either. Seeing as how they are buying new everything else they might as well look at new pistols. Even in the US I have seen American writers describe the Makarov as an ideal second weapon... small, handy and quite accurate... if a little underpowered. Of course at the end of the day a bullet through the brain is a bullet through the brain and the argument of 9mm vs 45 cal has been done to death. 8 Shots with a Makarov should be fine compared with a 6 shot revolver in 38 special. In my experience bullet placement is rather more important than anything else, though having a round with sufficient power to do the job is important too. It would be interesting to see the list of Russian small arms accepted by the Russian Army as standard weapons... we have heard about all sorts of decisions like the P-2000, etc etc. Personally I like the Klin/Kedr weapons for their compact size, and the Kashtan for its performance. The Bizon looks nice in terms of ammo capacity but I think the Vityaz with the AK-12 ambidextrous controls would be a real HK MP4 killer. There are several competitors in the pistol and rifle categories too. Nice. I was kind of hoping the 9x21 version would be chosen over the 9x19, but it probably doesn't make much of a difference anyways. I find it odd that the Defense ministry would choose to replace the PM at this point in time, when there are still much more urgent matters that need to be addressed, such as issuing decent individual protection to all front line troops. It's kind of weird to see some Russian troops still running around with those old Soviet SSh-40 and SSH-68 steel helmets. I mean for Special forces, sure, I can definitely see the Strizh coming in handy. It's versatility is leaps and bounds ahead of the Makarov. For most troops, however, the PM can probably do the job just fine. I don't know, I'm no expert, but I would probably wait until more Russian ground troops were properly equipped with more important items like body armor and helmets before I went and started buying new handguns. I suspect they are working on standard kits for different soldier roles and this will replace the Makarov within these new kit sets. Obviously there will be other pistols used for different roles and they need to get this pistol tested full and then put into mass production before we can really talk about it actually replacing the Makarov. New helmets and body armour will be part of the new sets... in the mean time they will likely get what they are issued. A video comparison of the Strizh and the PM, in Russian only. The more I see of it the more I like it. For me a pistol is a rare and exotic weapon because the laws regarding pistols are fairly strict here in New Zealand. Within most military forces I feel there is probably a similar aura as few militaries will issue pistols widely. In terms of fighting someone a knife makes it easier to fight than bare hands, next up would be something like a shovel or sword that gives better reach, but if we keep to modern Russian weapons.. the bare minimum is your fists and feet, then knife, then spade, then pistol, then SMG, then AR etc etc. Against someone who knows what they are doing then you are better off with a weapon higher up that scale, but there are no guarantees of success. Of course at the end of the day a Makarov is not a bad weapon, it is small and compact and light and it makes 9mm holes in people like other pistols do. With the new pistol however they now have a weapon that is in no way inferior to any foreign equivalents. I remember being terribly disappointed in Call of Duty with having to use a German pistol... it really needed a Tokarev TT-33 and a Nagant revolver... it also could have used a DP-27 as an equivalent to the BAR. One of the things I like about the Stalker games is being able to use a proper Makarov... including the suppressed model... which I think is cool. English version of the video I posted earlier. Its strange to say the least. It pistol look and sound good. But the selection of this new Strizh pistol looks like the MOD promoted effort to get more private players into enjoying Russian military's fund. I don't see the need for the Strizh when the Gsh-18 is available. Apparently the Gsh-18 doesn't really hold any advantages over foreign handguns such as the glock or berreta, and has rather poor quality of manufacture. It works well enough, there's just no reason to use it over higher quality western handguns. The GSh-18 fires underwater reliably, and I would suspect that it is probably very reliable and almost certainly cheaper than western equivalents. The main issue I would see is that the ammo the Russian Handguns are designed to use, while it is 9 x 19mm calibre it is loaded to much higher pressures than western handguns and would be equivalent to the P++ rating normally used in SMG ammo in NATO. That might be why they are talking it up... perhaps the deal is that if you buy it and put it in service we will do the same. It works well enough, there's just no reason to use it over higher quality western handguns. GarryB wrote: The GSh-18 fires underwater reliably, and I would suspect that it is probably very reliable and almost certainly cheaper than western equivalents. True enough. 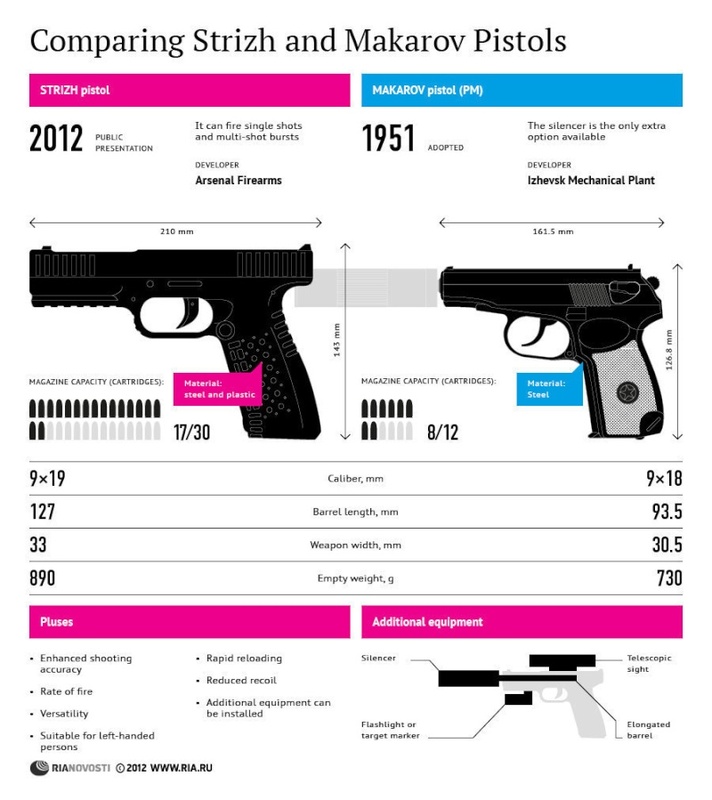 Although from what I've read the Gsh-18 isn't really all that cheaper than a lot of western handguns, which is another main reason for it not catching on. In all honesty for the same price I wouldn't mind some "gold plating". True enough. Although from what I've read the Gsh-18 isn't really all that cheaper than a lot of western handguns, which is another main reason for it not catching on. It is probably more expensive than it should be because of the small production runs... a decent large order should solve the problems of price. In all honesty for the same price I wouldn't mind some "gold plating". Gold plating in this context means unnecessary quality that does not effect the performance or handling of the weapon. In fact it would make it worse because gold needs to be kept clean but is a soft metal that will wear off with excessive use. BTW I have now read the article and it says the GSh-18 has the good features of the Glock but is more reliable and passes much harsher tests applied by KPB that the Glock failed. It says there are a few rough edges and the finish is not as crisp as on western models... and I say big deal. These are trivial criticisms and should be easy to deal with for a large production order. A real problem would be poor reliability, or components that break a lot, or poor accuracy, or lack of power. It would be very simple to add a few extra steps at the end of the production cycle to improve surfaces and remove sharp edges before putting these weapons in the boxes they are sold in... for an accurate, powerful, and reliable weapon I could put up with wearing gloves till I got it to a gunsmith to tidy it up. I didn't literally mean gold plating. I thought the term gold plating was referring to little things like a comfortable grip or a smooth slide, just small things that don't really effect the combat effectiveness of the weapon in any major way, but are desired attributes nonetheless. It's a good gun, but there are weapons that have the same advantages (minus underwater operation of course) without the disadvantages. The fact is you barely see any Gsh-18s in service today, and there has to be a reason for that. The Strizh seems like a solid design though. I wouldn't mind seeing Russian paramilitary forces dropping their glocks and picking up the Strizh instead. The term gold plating usually refers to unnecessary or extravagant extras. A comfortable grip, or parts that don't injure your hand would not be considered gold plating. Actual gold plating on the slide that did not effect the function of the weapon that was added to make it look "cool" would be one example as it would add expense without making it any better in any practical sense. Improved fit and finish and the removal of sharp edges is not about curing cancer, it is something that could easily be added to the production process. It's a good gun, but there are weapons that have the same advantages (minus underwater operation of course) without the disadvantages. The Glock is a good gun but it failed the testing that the GSh-18 passed. 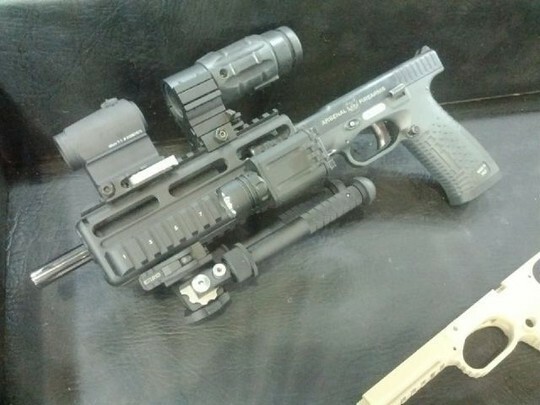 I rather suspect that it would be easier and cheaper to improve the fit and finish of the GSh-18 than to reengineer the Glock to pass the test. The fact is you barely see any Gsh-18s in service today, and there has to be a reason for that. Makarovs are cheaper and already in stocks? The GSh-18 has been in production and service for a while now, so they should have gotten plenty of feedback on what was liked and disliked about the design. AFAIK it has been adopted by quite a few forces already, but the budget for new pistols is not huge... I rather suspect they have a lot more 9 x 18mm ammo in stocks than 9 x 19mm NATO ammo for a start. Equally in their "Future Soldier" program they include the PYa, GSh-18, and SR-1 Gyurza pistols as being the standard pistols. Obviously over time weapons might be removed from this weapon set as it also includes AK-74M and AN-94, and also the SVD and Pecheneg and KORD 12.7mm cal HMG. I think on that article I linked it says something about the Gsh-18 undergoing improvements. Chances are the improvements are exactly what you described. GarryB wrote: Makarovs are cheaper and already in stocks? The GSh-18 has been in production and service for a while now, so they should have gotten plenty of feedback on what was liked and disliked about the design. Just to make things clear, when I said I thought the term gold plating referred to things like how comfortable the grip was, I didn't actually mean that I thought the Gsh-18 didn't have a comfortable grip. Every review I've read of it has mentioned it's well designed grip.